KATHMANDU, March 4: Investors both foreign and domestic have shown keen interest in investing in Nepal. 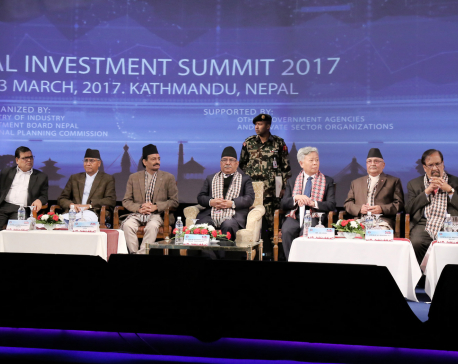 They signed letters of intent (LoI) for investing a total of $13.52 billion, at the concluding ceremony of the Nepal Investment Summit 2017 on Friday. Amongst the interested investors, China has signed LoI worth $8.3 billion, which is more than half the total LoI signed. Apart from some six foreign investors, domestic investors have also signed LoI worth $11.5 million, making for a total of 16 investing organizations. According to Minister for Industry Nabindra Raj Joshi, Bangladeshi investors signed LoI worth $ 2.4 billion, whereas Japanese and UK investors showed interest in making investments worth $1 billion. Likewise, investors from Sri Lanka and India have shown keen interest in investing $ 500 million and $ 317 million, respectively. The investors have shown interest in sectors like hydropower, hotels, metro rail, airlines, tunnels, tourism, energy, agriculture, infrastructure, mines and the financial sector, amongst others, he said. "They have signed the LoI, which means they want to invest in various profit-generating sectors in Nepal." However, Joshi said that in order to convert their interest into commitment, an investment-friendly environment is needed in the country and guaranteed returns from the investment. He also voiced commitment to protecting the investments. "The summit is the beginning of glorious days ahead and the economic development of the country," he said, adding that the country is on its way to transforming itself from a Least Developed Country (LDC) to a developing country. "The investments promised will certainly help push economic growth." Minister Joshi requested the foreign investors to invest freely in Nepal as all Nepali politicians have committed themselves to supporting the economic development of the country. 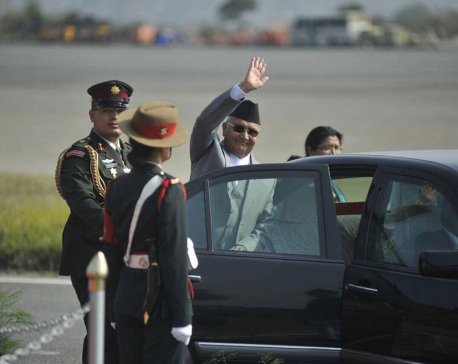 Nepal needs stable policy no matter how unstable the political situation, he said. He also said that within the next decade no Nepali youth should need to go to foreign countries for employment as investments will generate enought employment in the country. Foreign investment started to flow into the country after the first Investment Summit held back in 1992, as the government then started opening up sectors for foreign investment. According to the Department of Industry (DoI), some 3,678 projects with foreign investment have been registered as of last fiscal year. The department's data also show that these projects worth investments totalling Rs 358,707.80 million in costs have generated an estimated 217,681 jobs in the country. In the 25 years since a liberal economic policy was adopted, there has been a 40-fold increase in foreign investment projects from 93 in 1990 to 3,678 in the last fiscal year, according to the department. Of the total number of companies in the country, more than 100 as of today have transactions worth over Rs 1 billion, according to the Large Taxpayers' Office (LTO). "Some of the foreign investment companies including Ncell, Sipradi and Surya Nepal are among the large companies with transactions from Rs 10 billion to over Rs 20 billion a year, according to the LTO data. CTCE Group (China) -- Water Suppy, Hydropower, Railways, Road, Tunnel etc. -- $1 Bn. Everest Chamber of Commerce & Industries (India) -- Tourism -- $10 Mn. Frontier Power Ltd., London (UK) -- Energy, Agriculture, Infrastructure -- $1 Bn. Himadri Food Pvt. Ltd. (Pran - RFL Group) (Bangaladesh) -- Food & Construction -- $2.4 Bn. Somudyak Kansai Form, Mahottari (Nepal) -- Agriculture -- $1 Mn.